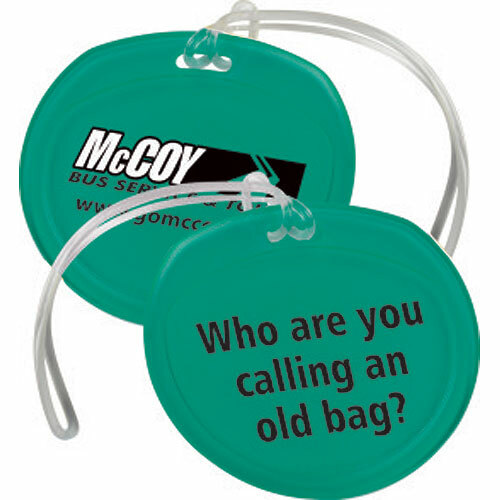 Round Sassy Tag-Recycled is made of recycled material.Now that is eco-friendly marketing. Please note "sassy saying" on the backside. Now you will know which bags is yours by checking the fun sayings when getting your bag off the conveyor belt at baggage claim. Choose one of the ten possible options when ordering. Includes sturdy strap. - Got Luggage? So Find it. This is MY bag. - Who are you calling an old bag? - We all look alike, but I'm taken. - What happens on the road stays on the road. - OMG! Stop grabbing me! - I'm going DIRECT.. to the laundry room. - Let me guess! You're not from around here.